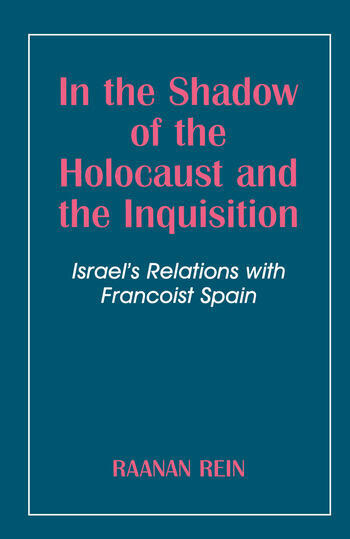 This is an analysis of the reasons for the failure of all efforts to establish diplomatic relations between Israel and Francoist Spain from the late 1940s to the mid-1970s. It uncovers the political discussions and the diplomatic moves of each country. The Jewish Chronicle - "a fascinating story well told." Middle East and Northern Africa - " Raanan Rein handles the archives of Britain, Israel, Spain and the United States with ease. Throughout the book, he usses Spanish and Israeli press accounts to fill the lacunae in available archices. This work is an impressive sequel to his first book, The Franco-Peron Alliance: Relations between Spain and Argentina, 1946-1955"
Diplomacy and Statecraft - "In this well-written (and well-translated) volume, which is based mainly on primary sources, such as government documents, newspapers and personal interviews, Rein meticulously describes the efforts of both governments to develop a formal relationship with the other ... It can be read with profit by anyone concerned with the way international diplomacy truly works (as opposed to the way many statesmen and scholars would like diplomacy to work)"
The International History Review - "well researched and well-written study"
"A fascinating study of the relations between the two states... Rein"s book s commendable, particularly for his assembling of the historical data, the result of meticulous research conducted in Israel, Spain, the US and Great Britain. He has accorded appropriate weight to each of the many facts and theories surrounding the emotional relationship between Israel and Spain."